The final chapter in the story of the 2016 Bellefonte Red Raider baseball team will be written Friday when the Raiders take on Susquehanna Township in the PIAA Class AAA state championship game at 1:30 p.m. at Medlar Field on the Penn State campus. How Bellefonte arrived at this juncture and the fact that this chapter is being written at all are parts of one of the most captivating stories in District 6 baseball in a long time. There was little fanfare back on May 24 when the Raiders entered the District 6 playoffs as the fifth —and last — seed in the AAA bracket. After all, Bellefonte got off to a miserable start in 2016 and fought game by game just to get back close to .500 by the end of the regular season. Greater Johnstown, one seed higher, probably noticed something when Bellefonte 10-runned them in the first round of the tournament, but that game was played just for the right to match up with rested and No. 1 seeded Somerset. Yet Somerset didn’t fare much better against the Raiders. In fact, Somerset didn’t score a run in Bellefonte’s 2-0 win and didn’t have much of a clue against Raider pitchers Adam Armstrong and Dominic Masullo. Hollidaysburg was next on June 1 in the district final with a berth in the state tournament on the line. It was in this game that the Raiders established the fact that they could come back, in pressure situations, to win. Down 4-2 late, Bellefonte scored five runs in its last two at bats and overtook Hollidaysburg for a 7-5 win and the D6 championship. Somerset was one thing, but now as District 6’s lone representative in the state tournament, Bellefonte traveled to Fox Chapel High School to take on the No. 1 seed from District 7 and WPIAL champion Chartiers Valley. The Raiders stuck to the program against the Colts — no-mistake defense, solid pitching and some late offense — and pulled off a 2-1 win in what many people called a major upset. 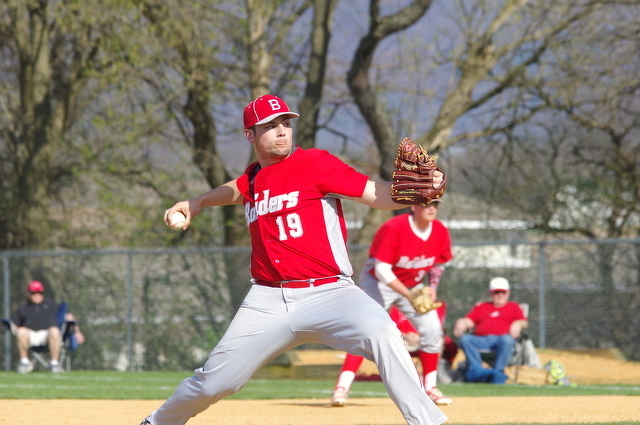 Masullo and senior Kyle Mellot did the work on the mound for Bellefonte, with Masullo getting the win in five innings of two-hit pitching. On June 9, in the state quarterfinals, it was another No. 1 seed, this time District 10 champion Erie Cathedral Prep. With first starter Masullo unavailable after his win over Chartiers Valley, Bellefonte started Armstrong against Prep. Armstrong was given just one run to work with, on an RBI by junior Tyler Kreger, but he made that run stand up. Armstrong pitched a complete-game, one-hit shutout, striking out four and walking only one, as the Raiders advanced to the semifinals after their 1-0 win. On June 13, with a trip to the state final at Penn State in sight, Bellefonte took on Hamburg (3-3) at Greene Township Park in Scotland. In almost a flashback to the D6 championship game against Hollidaysburg, Bellefonte scored four runs in its final two at bats to surge past the Hawks for an exciting 6-5 win. Storm Smith lined a two-out, two-on double in the bottom of the seventh inning that scored Tanner Helms and Cade Fortney with the tying and winning runs. Masullo, in four innings of relief, took the win and the Raiders advanced to the state final for the first time in their history. Now, the Raiders will face Susquehanna Township from Harrisburg for the state championship. Any resemblances between Bellefonte and Susquehanna may be coincidental, but there are many of them. The Indians’ road to the finals in not unlike Bellefonte’s. There was a close 6-5 win against highly talented (and perhaps favored to win it all) Archbishop Wood out of District 12. Then came a 10-0 blowout of District 11’s Palmerton, before a tense, 1-0 victory over North Pocono in the semifinals. In the North Pocono game, the Indians’ Eli Weikert looped an RBI single into right field in the top of the seventh inning. Susquehanna pitcher Austin Dressler, who struck out 13 in the game, then wrapped things up in the bottom of the inning to send his team into the finals. Beside Dressler, Susquehanna has two other pitchers who have impressive post-season wins — Ben Moser (2.00 ERA) and Dan Warshawsky (2.81 ERA). At the plate, the Indians are led by Chris Ciotti, who is hitting .410 and will play for LaSalle University next year, Jake Pae, Dressler, Warshawsky, Rhyce Hammacker and Weikert. Susquehanna Township finished as the No. 3 seed out of District 3 and is 19-8 for the season. Like Bellefonte, the Indians are hitting their stride at just the right time. And also like Bellefonte, they always seem to come up with another outstanding performance or another great play at precisely the time they’re needed most. If these playoffs are any indication of what is to come, no lead will be safe in this game until the final out is made. Penn State fans might be rooting for the Jordan Spieths and Jason Days of the world, but if you want to see some former Nittany Lions give the US Open a run you have two chances to do so.